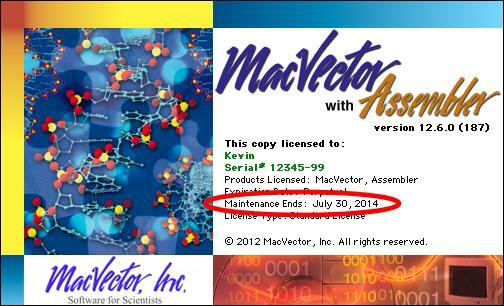 If your "Maintenance Ends:" date reads October 1, 2013 or later, you will be able to run MacVector 13. If not, you can register to download the trial version, then contact your local MacVector account manager (sales@macvector.com) to learn about upgrade options. All customers who are eligible to run MacVector 13 should use this link to download the MacVector 13 installer. Also, please note the MacVector 12.7 requires OS X 10.6 ("Snow Leopard") or later. Unlike MacVector 12.7, this release will NOT run on OS X 10.5.